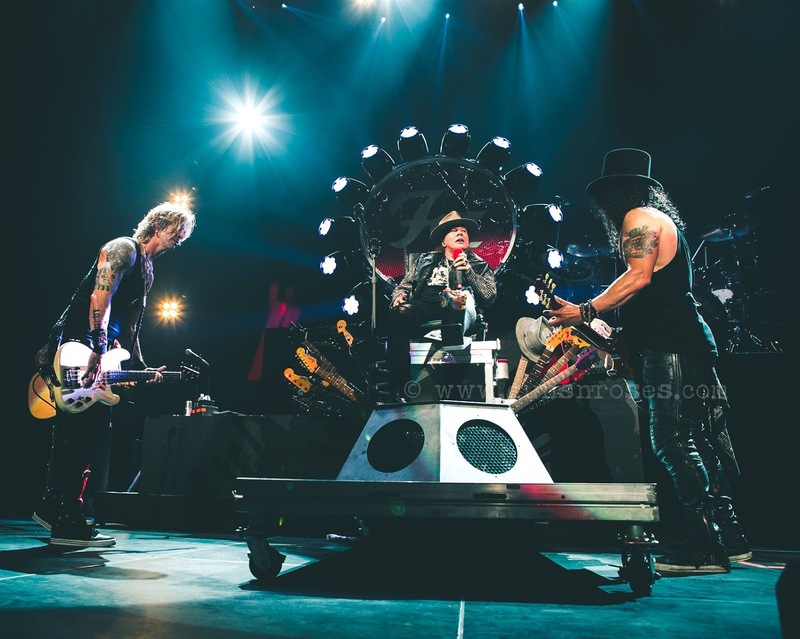 Though it was not a total reunion as only Axl Rose, Slash and Duff McKagan were present and the former band members Izzy Stradlin and Steven Adler weren't on board, fans are not complaining that much because they played together after 23 years (last was in 1993). And that was not all of it. It was just not a one night show. The band had already announced a bunch of North American shows for their current Not in This Lifetime tour, and today (April 25) they added a few more. Guns N’ Roses are making headlines quite often since last few weeks, but it’s unfair to blame the media. When at Coachella, people were enjoying the reunion of the classic line up, the band introduced a guest guitarist. And what a coincidence! The guitarist was no one but Angus Young in his usual school boy uniform, the lead guitarist of the iconic metal rock band AC/DC. The band just confirmed that Axl Rose is going to replace their lead vocalist Brian Johnson, who is going to step back after suffering from some hearing issues. So the crowd witnessed the preview of the future AC/DC tours featuring Axl Rose as the lead vocalist and Angus Young as the lead guitarist. It was indeed not in this lifetime show. The band played some of their best hits including songs like Sweet Child O’ Mine, November Rain, Don’t Cry, Knocking on Heavens Door. A worthy mention would be the band's tribute to Pink Floyd and Eric Clapton when they played Wish You Were Here followed by Layla before they performed their all time hit November Rain. For those who missed it, here is the clip. Axl Rose will tour with AC/DC and again reunite with Guns N’ Roses in June. We don’t know the surprises yet to come. Guns N’ Roses reunion was a huge expectation among GNR fans. There were several rumors over the years and fans got disappointed when they heard that Slash and Axl Rose were not in any place near to mend things. But finally they crossed the bridge together. Critics are saying that this reunion is nothing but a good deal of business with no strings attached. We don’t know yet, if other original band members are going to join them later. But it was really enough to experience Guns N’ Roses once again rocking the stage. Time has changed. In some part Axl Rose seemed out of sync, but Slash was as usual smooth on his guitars with his fingers dancing on his guitar frets. May be nothing has changed as long as their music is concerned. Here are some videos of their classic shows. Stay tuned for more news.